Juices are always a good way to kickstart your day. That is why, Truweight has brought this healthy and mildly spicy ash gourd and mint juice for you. Ash-gourd is a great source of vitamins and minerals namely vitamin B1 (thiamine), vitamin B3 (niacin), and vitamin C. Among the minerals, it proudly boasts of the bone-building calcium, blood pressure reducing potassium among others. Mint, on the other hand, must not be relegated just as a garnish! It is one of the most unassuming source of antioxidants. A few sprigs and you are taken care of! So will you drink this healthy mojito of sorts? 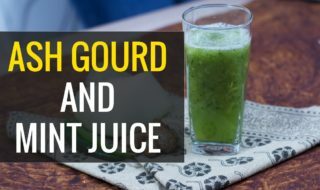 Place ash gourd, green chilli, mint leaves, salt and water in a blender and blend them thoroughly. Add lemon and pepper powder to the mixture and blend them further. You are now ready to have your glass of spicy ash gourd and mint juice.